As we get closer and closer to Christmas, the panic starts to set in and I find myself searching the web and Pinterest for fun wrapping ideas. Sure green and red work well, but I usually get more excited about the non-traditional kind of wrapping. I like things I can find at my local stores or even better, if you can use things that are easy to come by in your office or home, well, bonus! So here are some gift wrapping ideas I found for the holidays that will not break the bank and add a special touch to your gift giving or at least look great under the tree. This is a very clever idea for an advent calender or small gifts. 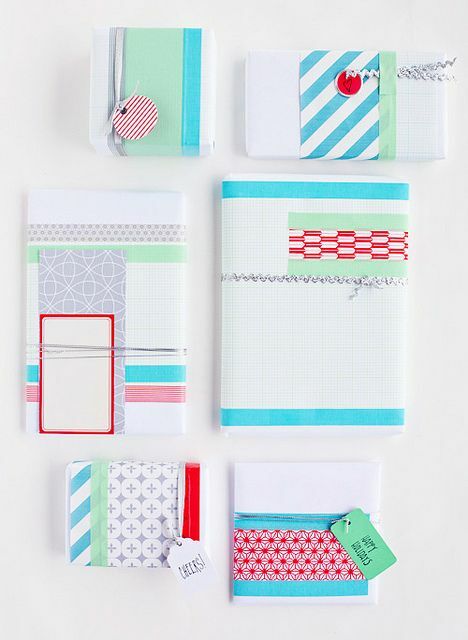 Take newspaper or magazine pages and use washi tape as ribbon to create a fun package. Image via Casa di Falcone. From Eat.Sleep.Cuddle – some hand stamped gift wrap on plain brown paper looks festive and modern. A fun and easy DIY project. 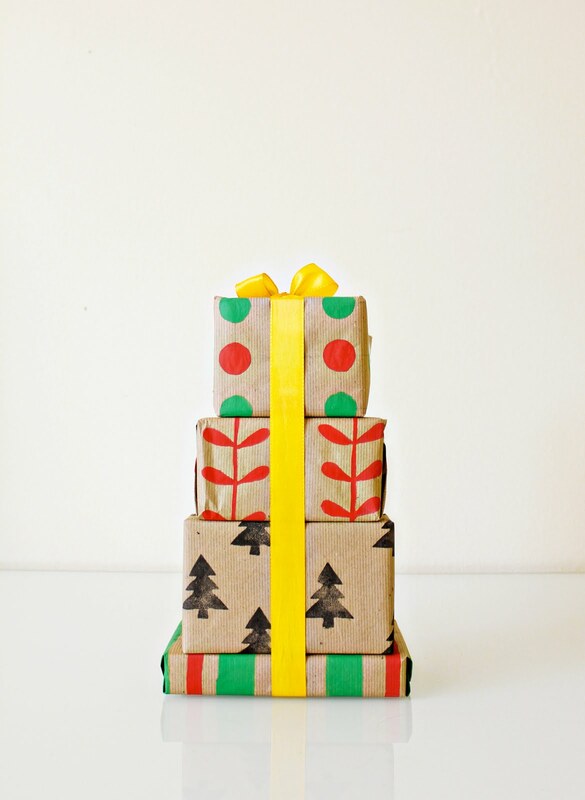 Here is a great way to to use household items around the house to create a modern gift wrap. I love the use of graph paper, fabric scraps and twine to create a sophisticated holiday color palette. Image via Deko. 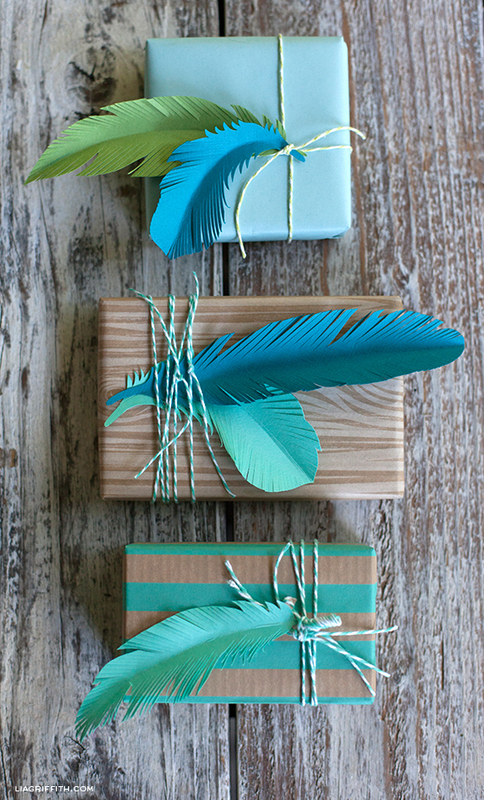 DIY paper feathers and bakers twine are a great alternative to traditional bows and ribbons. Image and instructions by liagriffith.com. Via Decor8 , a slightly unconventional holiday color scheme created from crepe paper, office supplies and washi tape. This idea is perfect for the naturalist. 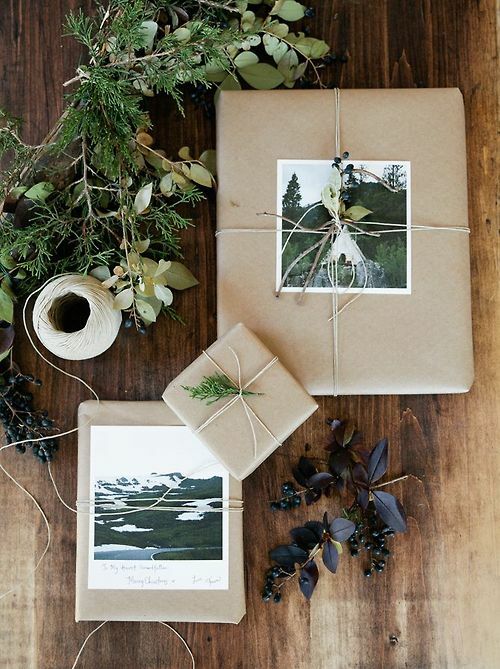 Brown kraft paper, simple greenery and twine. For an added interest add a picture or polaroid of mother earth. Image via themustardceilingblog.com. 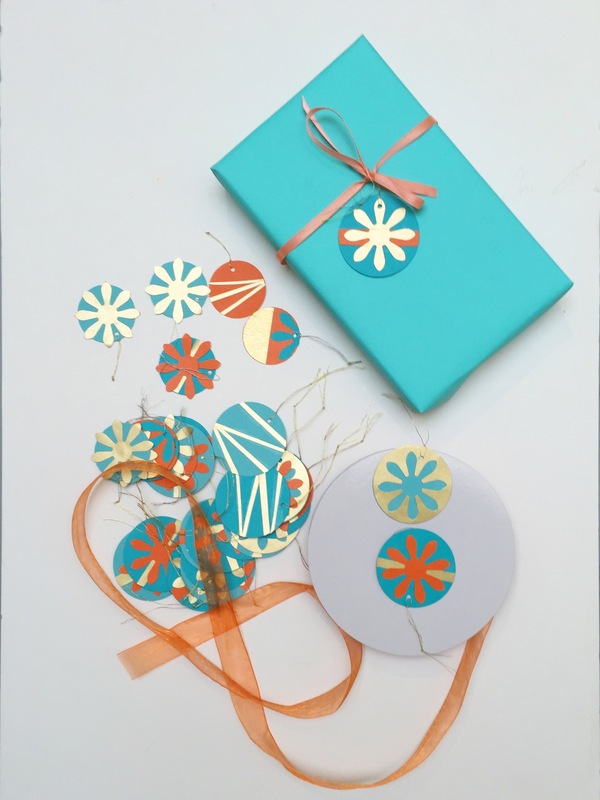 The picture above is our re-souL orange and turquoise wrap with some handmade gift tags. (orange and turquoise are our store’s colors) We just made some gift tags in the same colors with a touch of gold to make them more festive. They were created with various punch shapes and glued together to look like holiday ornaments. 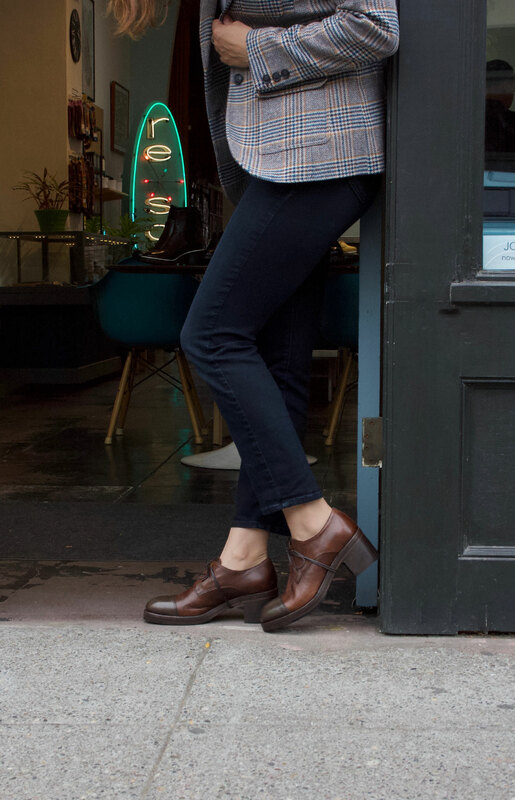 Everyday items can be made to look extraordinary. 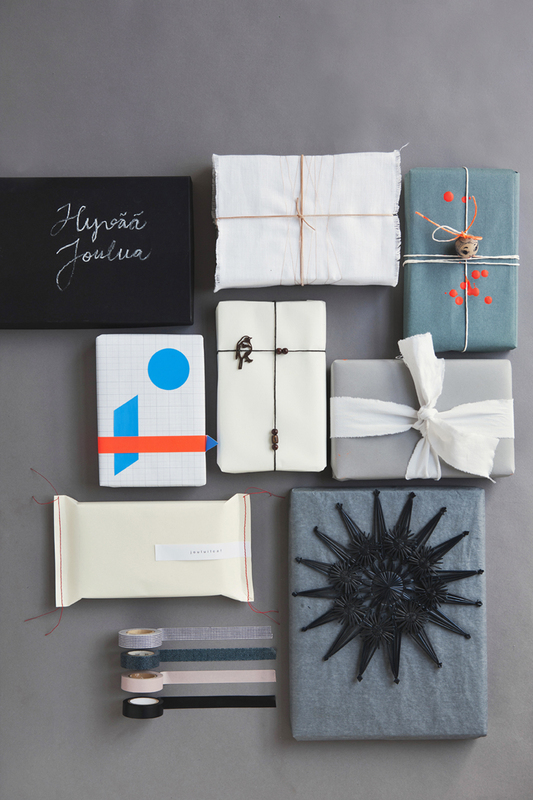 When it comes to gift giving use what you have and turn it into something unexpected.To see more holiday gift wrapping ideas visit our Pinterest board. Thanks for stopping by!